On November 15, the U.S. Department of Health and Human Services released findings from its audit [pdf] of the Pennsylvania Medical Assistance program. 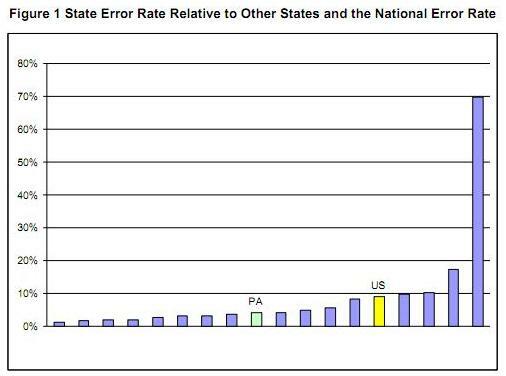 The audit found that Pennsylvania’s Medical Assistance, or Medicaid, error rate was 4.07%, less than half of the overall national Medicaid error rate of 8.98%. Pennsylvania’s lowest-income families, children, the elderly, and disabled rely on Medical Assistance. The Department of Public Welfare is to be applauded for administering this critical program so efficiently. This federal audit contrasts with Auditor General Jack Wagner’s report last year that the Department of Public Welfare had a much higher error rate in the Medical Assistance program. Why the difference? Auditor General Wagner’s audit confused administrative errors with intentional fraud. The Auditor General asserted that the Department of Public Welfare made errors in eligibility determinations for Medical Assistance applicants that countenanced fraud. In truth, many of the errors had no bearing on applicants’ eligibility: they were eligible for the program but simply didn’t provide (or the Department of Public Welfare couldn’t produce) the requested paperwork. The Department of Public Welfare should continue to modernize its operations to further reduce its low error rates. But to do so may require additional budget and staffing. The number of caseworkers in County Assistance Offices, for example, has been reduced dramatically as a result of budget cuts. There are currently more than 1,600 fewer staff at County Assistance Offices than there were in January 2003 – a 20% reduction. Meanwhile, the number of households that rely on Medical Assistance has ballooned from 1.8 million individuals in 2006 to more than 2.2 million individuals today – an increase of over 22%. The Auditor General’s recommendations (for example, that caseworkers verify income twice as frequently) would create an overwhelming administrative burden for caseworkers at a time when they are given insufficient resources to handle staggering caseloads. The effect on home ownership when entering a nursing home. The Aging & Disabilities Unit receives many calls from individuals and their families members about the effect that entering a nursing home has on the individual’s home ownership. In the community rumors abound that in order to enter a nursing home and to have Medicaid pay for it, you will have to give your home to the state. These rumors are wrong. If someone owns a home and requires long-term skilled nursing home care to be paid for by Medicaid, she can preserve her home ownership for the entirety of her life. This is true only for homes that the potential nursing home resident actually lives in, and not for non-residential property that an individual owns. When evaluating financial eligibility for a Medicaid nursing home grant, the Pennsylvania Department of Public Welfare (DPW) will always exclude as a resource a home that the applicant lives in. Again, to have Medicaid pay for long-term, skilled nursing care, an appplicant NEVER gives up the ownership of her home. Unfortunately, these rumors can cause individuals to take steps that will ultimately affect a person’s eligibility for Medicaid to pay for a nursing home stay. Sometimes, a home-owner will transfer their home to a family member thinking that this will protect their home from the state. When this is done, it actually can prevent an individual from receiving Medicaid, unless they receive actual payment of fair market value for their home. When an applicant applies for Medicaid, DPW will do an in depth review of an applicant’s financial history from the previous five years. If DPW discovers that an applicant has transferred a home for less than fair market value, it will penalize the applicant by denying her Medicaid for a period of time. If a homeowner anticipates a stay in a nursing home facility, she should contact an attorney before transacting any business regarding the ownership of her home. The rumors of losing one’s home, we believe, have their origin in Pennsylvania’s Estate Recovery Program (ERP). ERP is a program mandated by the federal government that requires all states to seek recovery from the estate of a deceased person the cost of long term nursing care paid for by Medicaid. This law is only applicable to Medicaid recipients over 55 y.o. Additionally, this law only takes effect after the person receiving nursing care has passed away. Because Medicaid is a program for low-income individuals, often the only asset left in a person’s estate is the home. Upon the death of the Medicaid recipient, DPW will send a letter to the family asking for an accounting of the deceased’s estate. This will be followed by a claim from DPW for the cost of care provided while the individual was receiving a Medicaid grant. However, there are many ways to avoid having to subject a home to estate recovery. The law requires that DPW grant hardship waivers in certain circumstances (spouses, disabled children, care-givers who provided significant care prior to the entry of deceased into a nursing home). CLS often works with family members to get these waivers. 1) You do not have to give up ownership of your home in order to receive a Medicaid grant for long-term skilled nursing care. 2) Recovery from the individual’s estate after they decease is not inevitable, and many times avoidable.